Guests must cancel in writing. The cancellation must be received by the Youth Hostel at least eight weeks before the planned arrival date. A change in the number of guests must also be communicated in writing at least eight weeks before the planned arrival date. For cancellations of reservations made within the four-week period before the arrival date, the regulations outlined in the next chapter under Cancellation Payment will be applicable in all cases. If the cancellation period has not been complied with or if there is a reduction by at least ten percent with respect to the guests who were booked and those who arrive, or if guests do not arrive at all, a compensation of fifty percent of all stipulated services per person and day will be claimed by the Youth Hostel, unless the guest proves that a lesser damage or no damage has been incurred. If the costs incurred to the Youth Hostel through the withdrawal are shown to be higher than this lump sum, the guest will owe the calculated sum. The compensation will be forgone if other guests occupy the stipulated services. Guests who, through their own fault, incur damages on buildings or inventory will be held liable for damages according to the legal regulations (educators and organizers included). Liability for the loss, theft or damage of valuables can only be claimed if the Hostel leaders or their representatives were expressly entrusted with their safe-keeping, unless the DJH, its agents or servants have caused the loss or damage as a result of gross negligence. In this case also the legal regulations are applicable. For damage to motor vehicles (contents included) and bicycles on Youth Hostel grounds, the Youth Hostel will not be liable as long as the damages were not caused deliberately or through gross neg-ligence on the part of the DJH or its agents or servants. 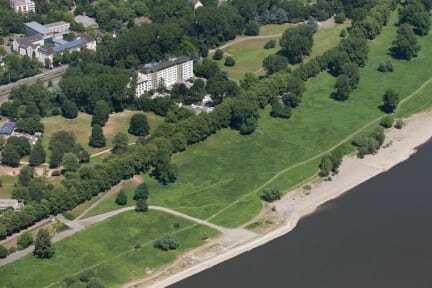 It is located in a beautiful, green area next to the Rhine River with excellent parks for inline skating, running, cycling or picnics. There are large, public playgrounds and green spaces for games directly behind the hostel. The centre of Cologne can be reached within only 8 minutes by tram or 40 minutes walking. 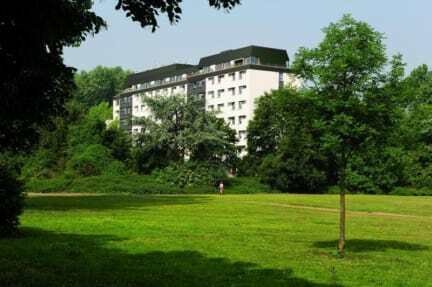 There are 186 rooms divided into singles, doubles, triples and four-bedrooms as well as 4-bed dormitories. All rooms are equipped with shower, WC and individual lockers. The large, public bus and car parking area right in front of the hostel can be used without a charge. Thanks to its well-lit and spacious rooms and the large number of conference rooms available, the Youth Hostel is perfectly suited for families, travel and school groups, backpackers as well as conferences, meetings and workshops. Taxes included, City Tax of Cologne is not included and to be paid upon the Arrival.